The lord held his hand out. The cat just sat and looked at god. The cat was not afraid of god. The cat would barely even nod. It’s eyes blinked slowly as it turned away. This entry was posted on Wednesday, January 11th, 2017 at 10:06 am	and is filed under The God Of Luck Don't Need No God. You can follow any responses to this entry through the RSS 2.0 feed. You can leave a response, or trackback from your own site. 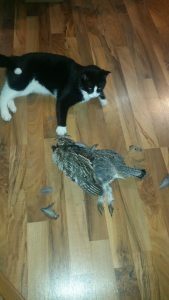 How Ivan got this owl through the cat door is beyond me but I stopped letting the furry beggar sleep on my neck after this kill. minus 46 degrees C today with the wind chill. Canada is no place for mankind so HUMANS STAY OUT!